This week: More fan art! Another giveaway! Also…Ted! So, it seems Bigfoot is a bit of a mimic though the skill doesn’t seem to assist him in securing companionship. And, for anyone worried about the wandering Scout, those with a sharp eye will note that he seems to have found shelter. Now, Ted. Nobody likes Ted. For some, Ted’s a teaching moment. For others, he’s a learning opportunity. Bottom line, you’re not supposed to like Ted. He’s a great example of how not to be. But you cannot deny the hypnotic power of his mustache. 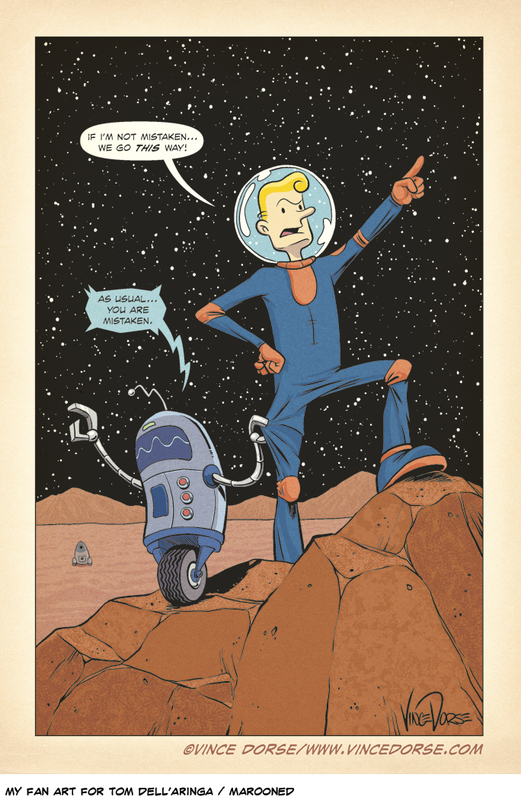 In the year-and-a-half since this page was originally posted, Tom ended up printing his Marooned epic via Kickstarter and subsequently took down his comic from the web. A sharp-eyed reader reminded me the fan art I did for Tom ended up in limbo because of that change. 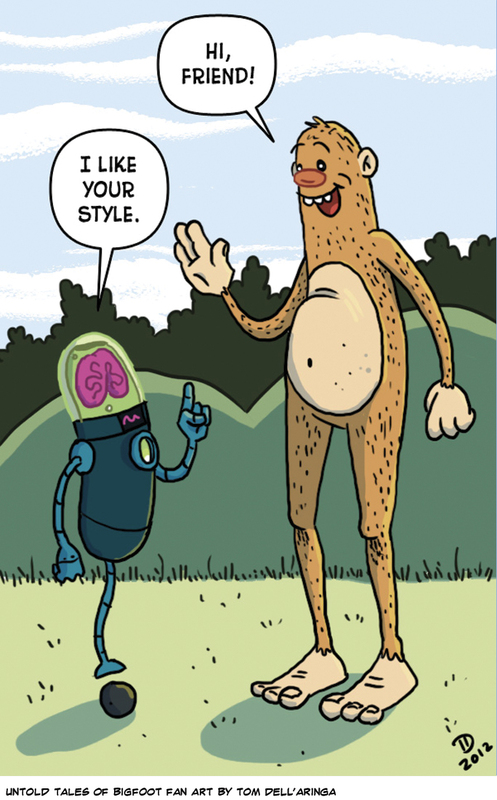 So I’ve come back from the future to post my Marooned fan art here for your enjoyment. So…enjoy it. Next Week: How’s Scout holding up? Find out next Wednesday. Untold Tales of Bigfoot is for grown-ups and kids. Let’s keep the comments appropriate. I like how Ted the sleaze can be seen to cast the shadow of a monster as he makes his move on the girl. well done. I would have loved to see the girl driving the car with scummy Ted racing after on foot. Oh, he totally deserved that! Maybe I should’ve doled out more severe retribution. Could’ve done two pages on Ted explaining to his wife why he’s four hours late for dinner. Wow this one was spot on, I love when something continues the story but still stands so well alone.